Bronze medal winners Oksana Masters (left) and Rob Jones, of the United States, on their prosthetic legs at the awards ceremony for mixed double sculls, on September 2, 2012, (AP Photo/Joerg Sarbach). Lex Gillette of the United States leaps in the men's long jump F11 (visual impairment class) at the 2012 Paralympics in London, on September 4, 2012. (AP Photo/Emilio Morenatti). 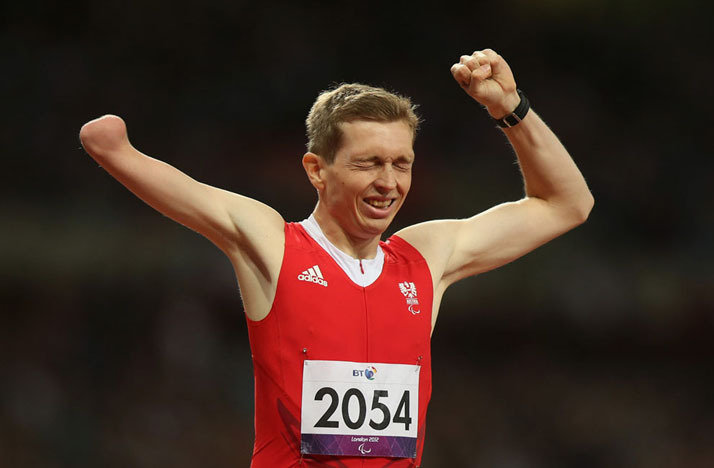 A member of the British team reacts during the Opening Ceremony for the 2012 Paralympics in London, on August 29, 2012. (AP Photo/Matt Dunham). China's Juan Yao competes before wining the women's shot put F42/44 final (for athletes with limb deficiencies, such as amputations) at the 2012 Paralympics in London, on September 3, 2012. (AP Photo/Emilio Morenatti). Laroslav Semenenko of Ukraine prepares to compete in the Men's 100m Backstroke - S6 heat 1 at the Aquatics Center, on August 30, 2012. The S6 classification is for swimmers with short stature, amputations of both arms or moderate coordination problems on one side of their body. (Clive Rose/Getty Images). Choochat Sukjarern of Thailand attempts a lift during the Men's -52 kg Powerlifting on day 2 of the 2012 Paralympic Games at ExCel, on August 31, 2012. (Matthew Lloyd/Getty Images). Lukasz Mamczarz of Poland jumps over the crossbar in the Men's high jump F42 final, on September 3, 2012. He won the bronze medal with a height of 1.74 meters. (AP Photo/Sebastian Widmann). China's Zheng Tao dives into the pool at the start of Men's 50m Freestyle S6 Final at the 2012 Paralympics in London, on September 4, 2012. (AP Photo/Emilio Morenatti). Italy's Assunta Legnante wears a mask as she competes in the women's discus throw - F11/12 (visual impairment) at the Olympic Stadium in London, on September 1, 2012. (Ian Kington/AFP/Getty Images). 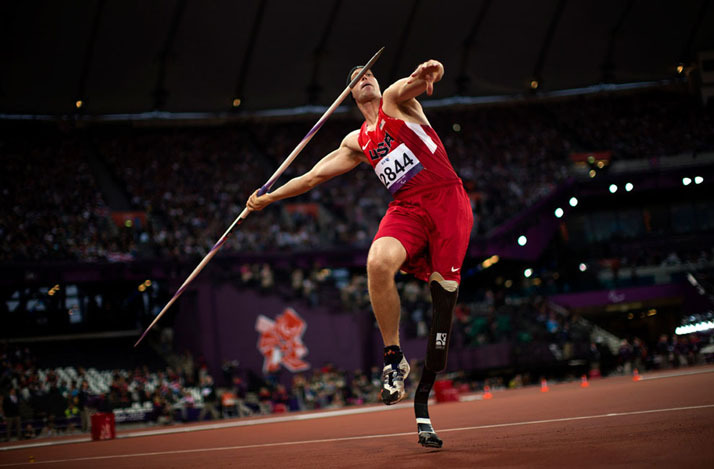 Jeff Skiba of the United States in the men's javelin throw F44 in London, on September 2, 2012. (AP Photo/Emilio Morenatti). 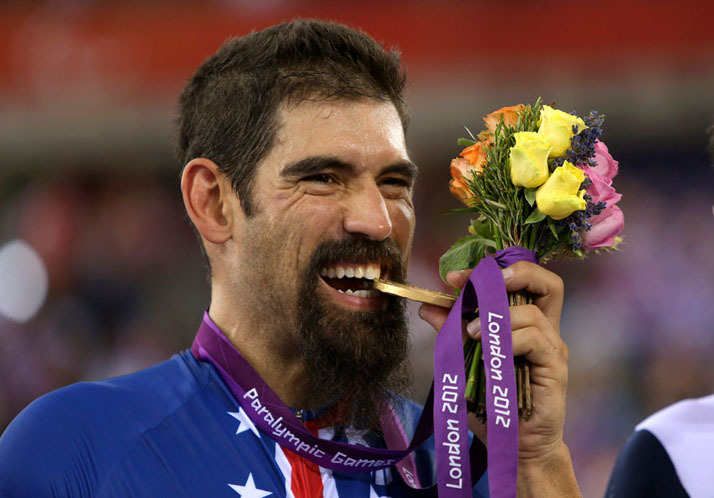 Joseph Berenyi of the U.S. poses with his gold medal after winning the men's Individual C3 pursuit (for cyclists with limb deficiencies, such as amputations) final during the cycling competition, on August 31, 2012, in London. (AP Photo). Shirley Reilly of the U.S. (right) and China's Zou Lihong fall from their wheelchairs after a crash during a women's 100m T34 race in London, on August 31, 2012. (AP Photo/Emilio Morenatti). Rustam Nurmukhametov of Russia, prior to his Men's 100m Freestyle S11 heat (for swimmers with complete or nearly complete loss of sight), at the Aquatics Center, on August 31, 2012. (Clive Rose/Getty Images). Nathan Smith of New Zealand competes in the Men's Individual Cycling C3 Pursuit qualification at the Velodrome, on August 31, 2012. (Hannah Johnston/Getty Images). Pattaya Tadtong and Watcharaphon Vongsa of Thailand celebrate winning a point during the Mixed Team Boccia - BC1-2 gold medal final on day 6 of the London 2012 Paralympic Games, on September 4, 2012. (Gareth Copley/Getty Images). Tamara Podpalnaya of Russia, after a successful lift in the women's -52 kg Powerlifting at ExCel, on September 1, 2012. (Matthew Lloyd/Getty Images). Canada's Paul Tingley (right) in the Single Person Keelboat (2.4mR) sailing competition in Weymouth and Portland, southern England, on September 2, 2012. (Reuters/Luke MacGregor). Britain's Jade Jones warms up before the women's 800m Wheelchair Race Final T54 Heat in the Olympic Stadium, on September 4, 2012. (Reuters/Stefan Wermuth). 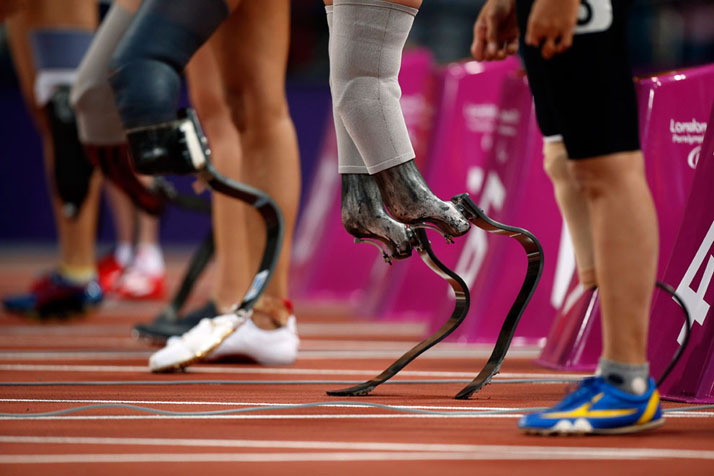 Yohansson Nascimento of Brazil uses supports for his arms as he waits on the blocks to compete in the men's T46 400-meter category final, on September 4, 2012, in London. (AP Photo/Alastair Grant). 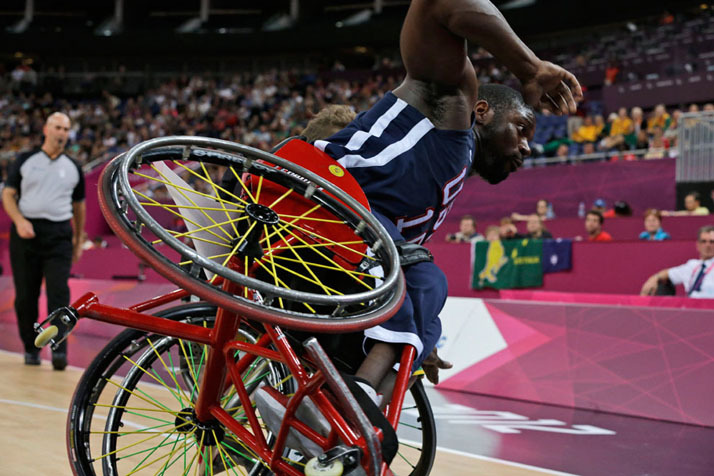 United States' Matt Scott falls during a men's Group A preliminary wheelchair basketball game against Australia in London, on September 2, 2012. Australia won 65-49. (AP Photo/Lefteris Pitarakis). 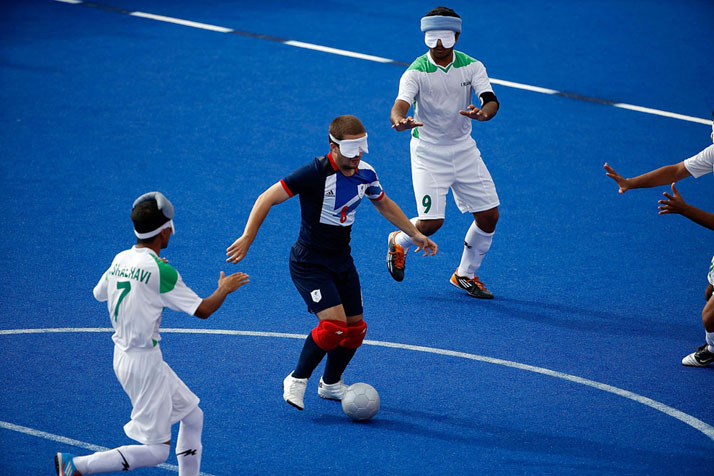 Lee Brunton of Great Britain takes on the Iranian defense in the Men's Team Football 5-a-side B1 (visual impairment) in the Olympic Park on September 4, 2012. All athletes wear eyeshades to ensure their visual impairments are equal. The ball is equipped with a noise-making device, and each team has a sighted, able-bodied goalkeeper. (Matthew Lloyd/Getty Images). 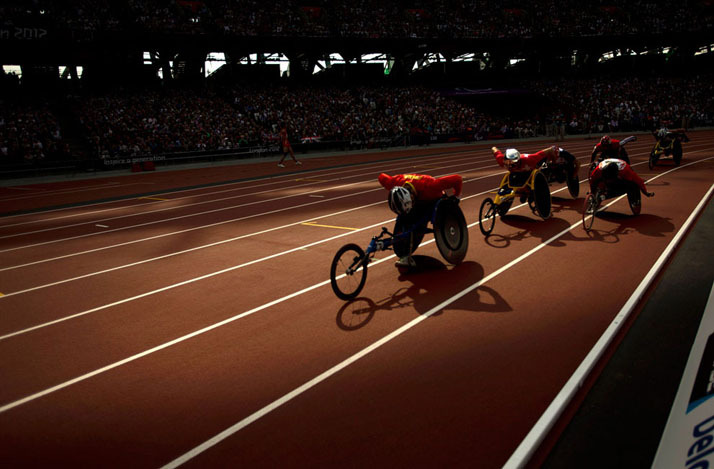 Athletes compete in the men's 1500m T54 round 1 wheelchair race in London, on September 3, 2012. (AP Photo/Emilio Morenatti). 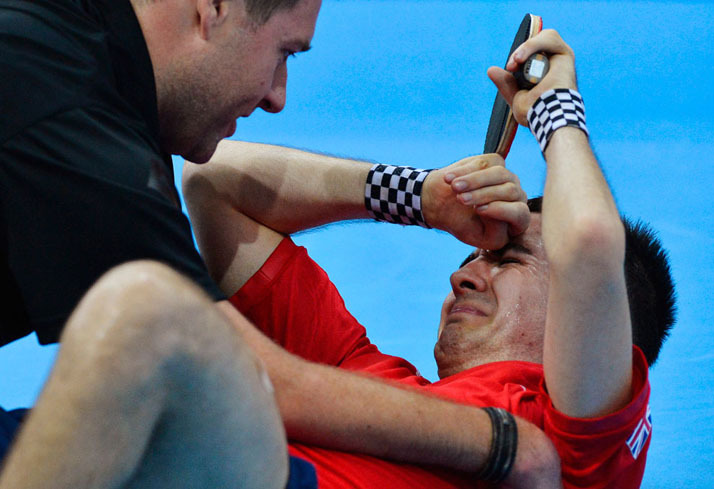 William Bayley of Britain cries after losing to Jochen Wollmert (left) of Germany, who embraces Bayley, following their Men's Singles C7 classification Table Tennis Final, on September 2, 2012. 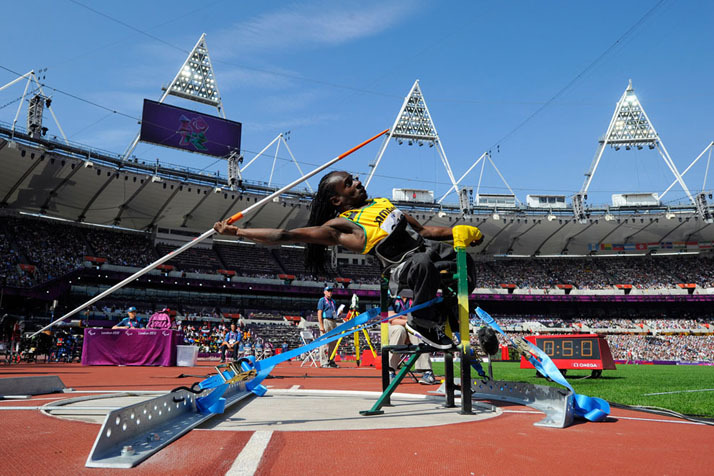 The C7 class describes a physical impairment for athletes who compete from a standing position -- the lower the number, the greater the impact the impairment has on an athlete's ability to compete. (Reuters/Toby Melville). 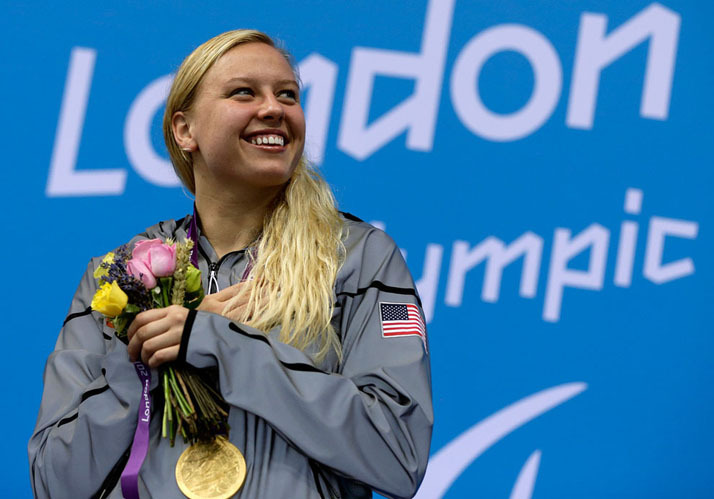 Jessica Long of the United States with her gold medal during the medal ceremony for the women's 100-meter breaststroke SB7, on September 1, 2012, in London. (AP Photo/Alastair Grant). 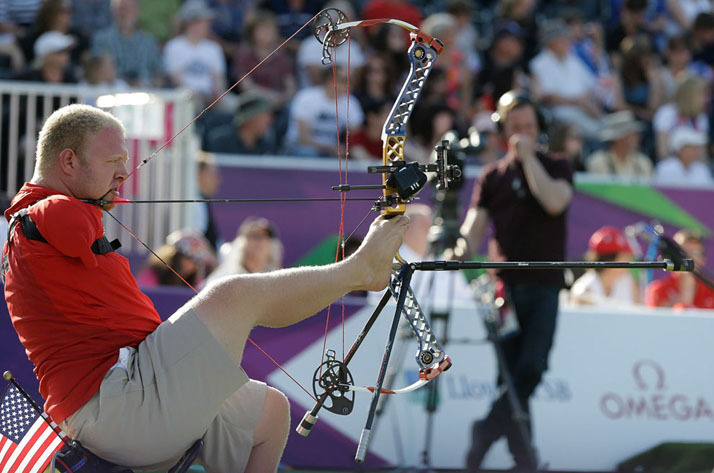 Matt Stutzman of the United States aims at the target in the men's individual compound open archery at the 2012 Paralympics games, on September 3, 2012, in London. (AP Photo/Alastair Grant). 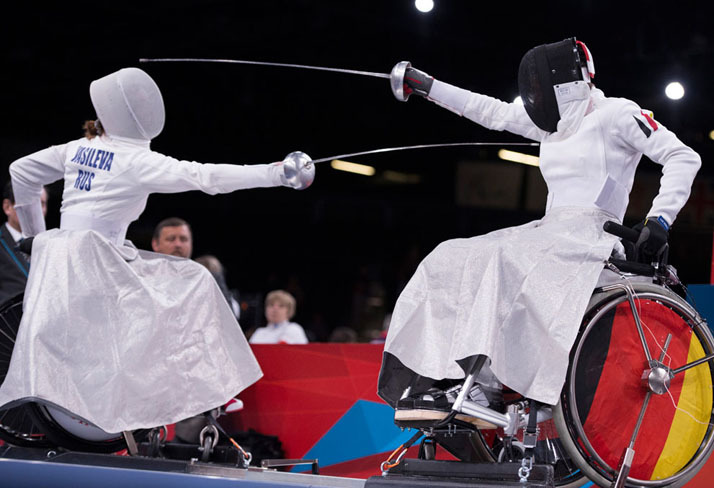 Germany's Simone Briese Baetke (right) fights against Russia's Ludmilla Vasileva in Women's Individual Foil- Category B at the ExCel venue, on September 5, 2012. Baetke won the match and moved into the quarter-finals. 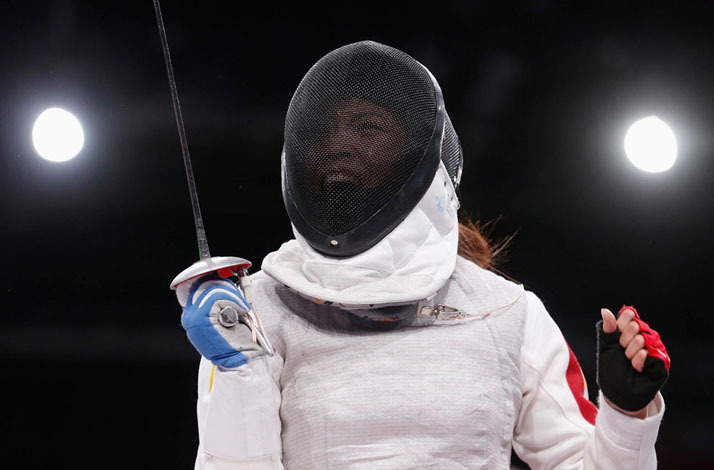 China's Jingjing Zhou, after her victory over Britain's Justine Moore in the qualification round of Women's Individual Foil- Category B on the first day of Fencing, on September 4, 2012. Category B athletes have an impairment that affects either their trunk or their fencing arm. (Reuters/Suzanne Plunkett). 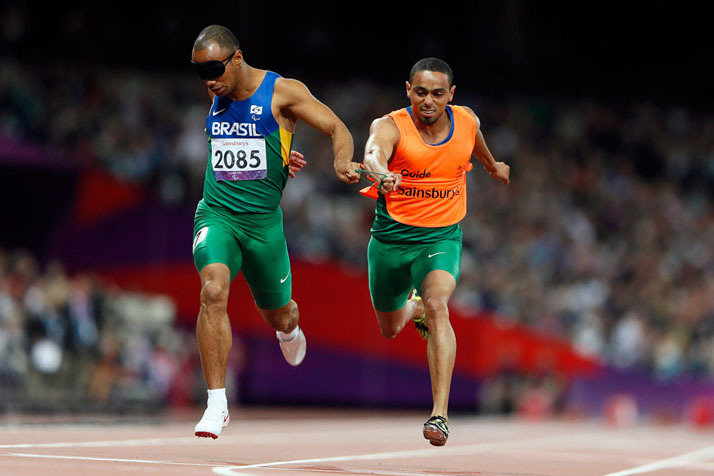 Brazil's Felipe Gomes (left) and his guide Leonardo Souza Lopes, run to win the Men's 200m Final T11 at the Olympic Stadium in London, on September 4, 2012. (Reuters/Stefan Wermuth). 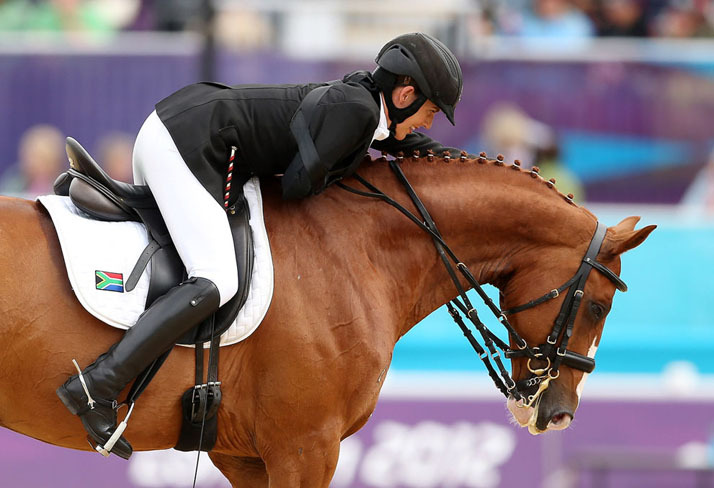 Philippa Johnson of South Africa, during the Dressage Individual Championship Test Grade - IV on day 4 of the London 2012 Paralympic Games, on September 2, 2012. (Scott Heavey/Getty Images). 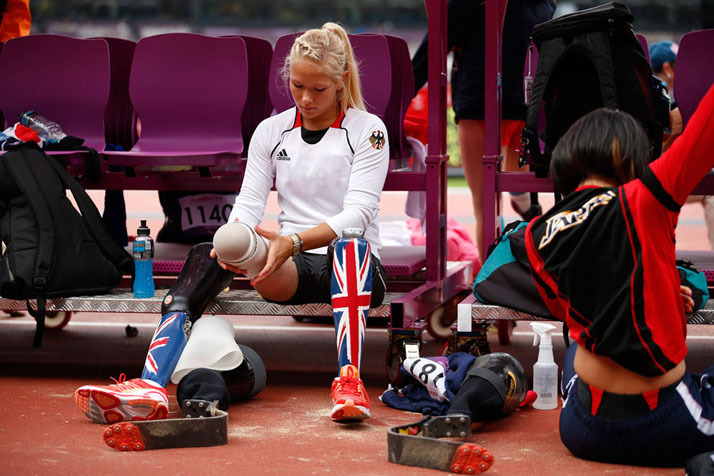 Vanessa Low of Germany prepares her prostheses for competition in the women's long jump finals, F42/44, on September 2, 2012. Low finished in sixth place. (AP Photo/Matt Dunham). 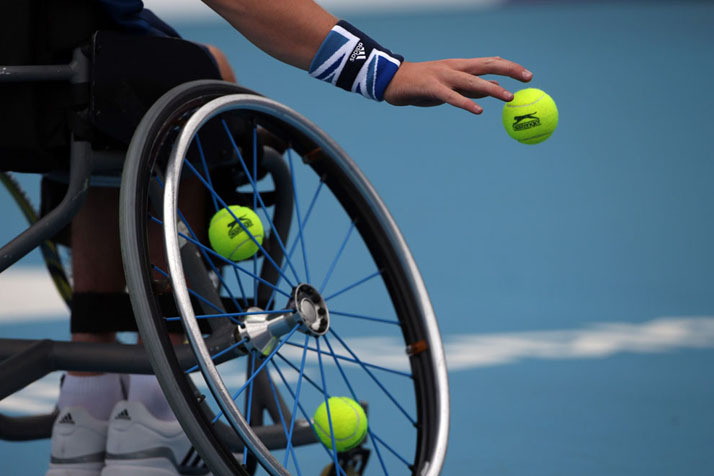 Gordon Reid of Great Britain prepares to serve during the Men's Singles Wheelchair Tennis round 64 match against Takuya Miki of Japan at Eton Manor, on September 1, 2012. Reid won the match 6-1, 6-2. (Peter Macdiarmid/Getty Images). 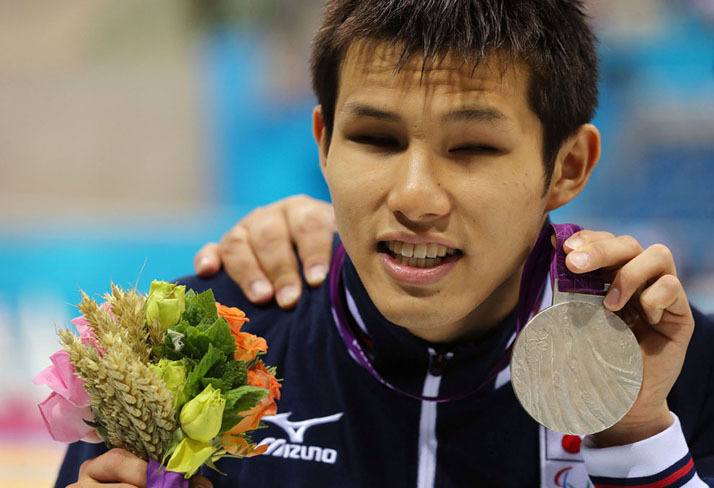 Silver medalist Keiichi Kimura of Japan poses following the medal ceremony for the Men's 100m Breaststroke - SB11 final on day 5 of the 2012 Paralympic Games, on September 3, 2012. (Scott Heavey/Getty Images). 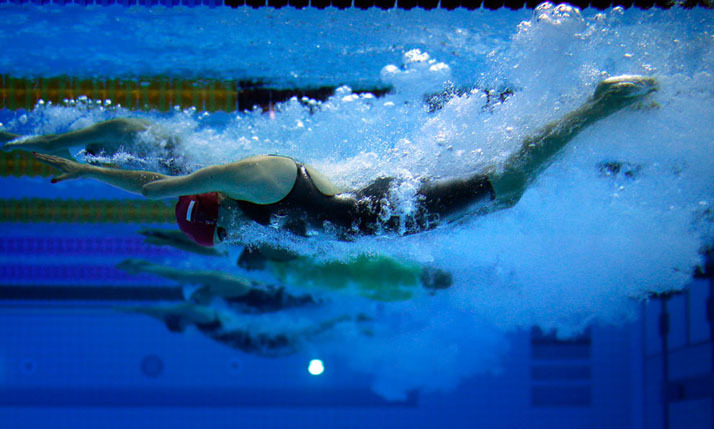 German's Christiane Reppe trains ahead of women's 100m Backstroke S9 category final, on August 31, 2012, in London. (AP Photo/Emilio Morenatti). 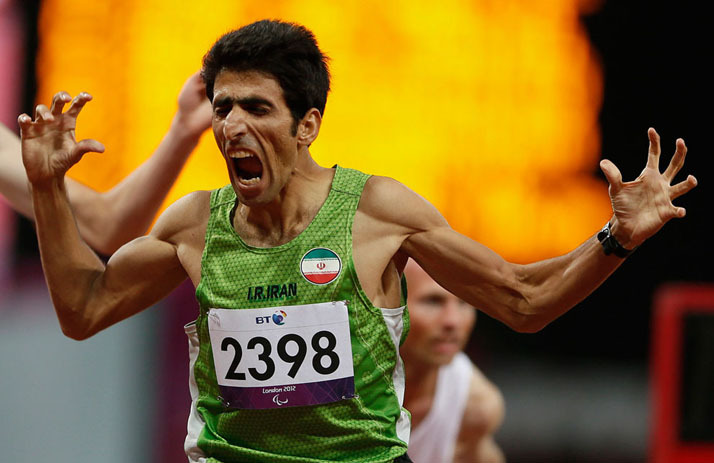 Iran's Peyman Nasiri Bazanjani celebrates after winning the Men's 1500m Final T20 in the Olympic Stadium in London, on September 4, 2012. (Reuters/Stefan Wermuth). 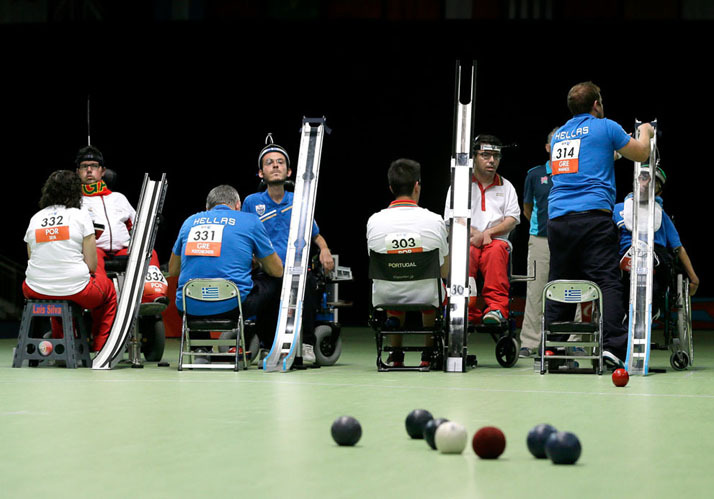 The Mixed Pairs BC3 Boccia final between Greece and Portugal takes place at the 2012 Paralympics, on September 4, 2012, in London. (AP Photo/Kirsty Wigglesworth). Terezinha Guilhermina of Brazil and her guide Guilherme Soares de Santana lie on the track after falling in the Women's 400m - T12 Final in the Olympic Stadium, on September 4, 2012 in London, England. (Julian Finney/Getty Images). 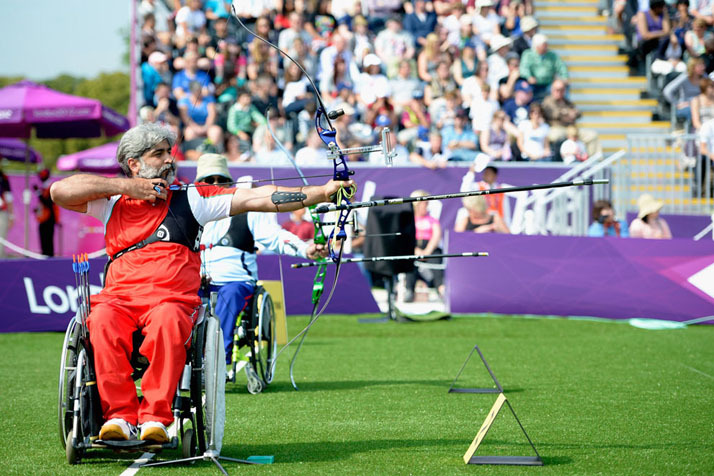 Ebrahim Ranjbarkivaj of the Islamic Republic of Iran competes in the Men's Individual Recurve Archery - W1/W2 at The Royal Artillery Barracks, on September 3, 2012 in London, England. (Dennis Grombkowski/Getty Images). Marcel Hug of Switzerland competes in the Men's 1500m - T54 heats on day 5 of the London 2012 Paralympic Games, on September 3, 2012. (Michael Steele/Getty Images). Marlou van Rhijn from the Netherlands, second right, waits to be called up into the blocks before the start of a women's 100m T44 round 1 race in London, on September 1, 2012. Van Rhijn won, setting a new world record of 13.27 seconds. (AP Photo/Matt Dunham). 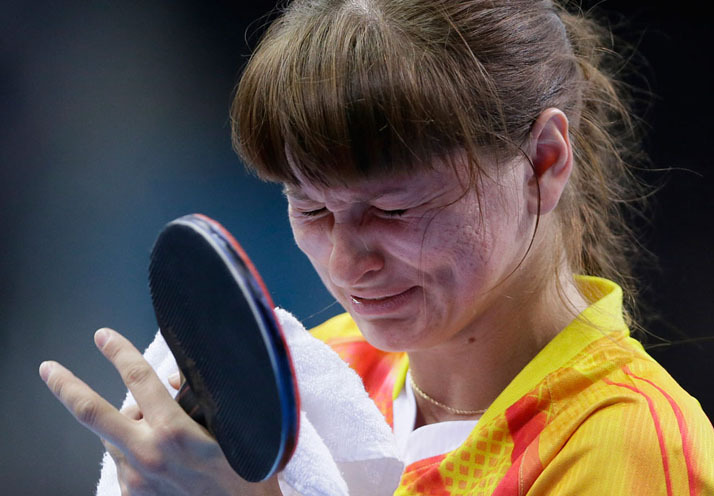 Russia's Yulia Ovsyannikova cries after winning her C7 table tennis semifinal match against Turkey's Kubra Ocsoy, on September 1, 2012, in London. (AP Photo/Kirsty Wigglesworth). Jamaica's Alphanso Cunningham, in the men's javelin throw F52/53 final in the Olympic Stadium, on September 4, 2012. (Glyn Kirk/AFP/Getty Images). 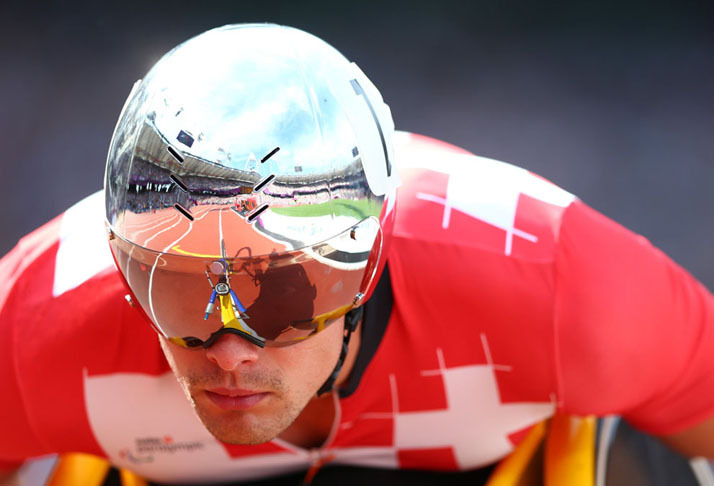 Gunther Matzinger of Austria competes in the Men's 400m - T46 Final in the 2012 Paralympic Games, on September 4, 2012. (Bryn Lennon/Getty Images). Poland's Paulina Wozniak swims in the Women's 100m Butterfly S9 category, on August 30, 2012, in London. (AP Photo/Emilio Morenatti). 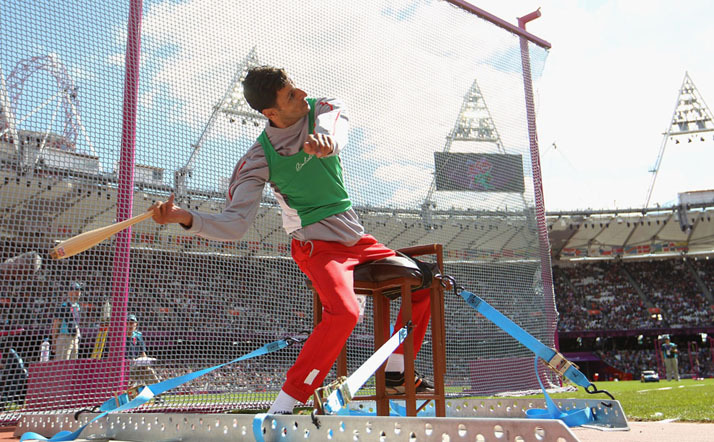 Lahouari Bahlaz of Algeria competes in the Men's Club Throw - F31/32/51 Final in the Olympic Stadium, on August 31, 2012. (Michael Steele/Getty Images). 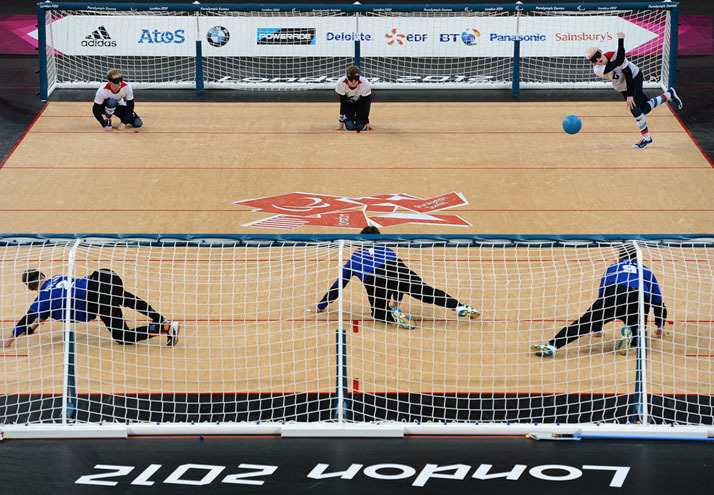 Adam Knott (back right) of Great Britain takes a throw in the Men's Team Goalball preliminary match against Finland on Day 4 of the 2012 Paralympic Games, at the Copper Box, on September 2, 2012. Finland went on to win the match 7-3. (Justin Setterfield/Getty Images). Joe Ingram of Great Britain (white) and Tim Rees of Canada (Blue) compete in the -100 kg Judo preliminaries at ExCel, on September 1, 2012 in London, England. (Matthew Lloyd/Getty Images). Germany's Vanessa Low competes in the Women's Long Jump F42/44 Final in the Olympic Stadium, on September 2, 2012. (Glyn Kirk/AFP/Getty Images). 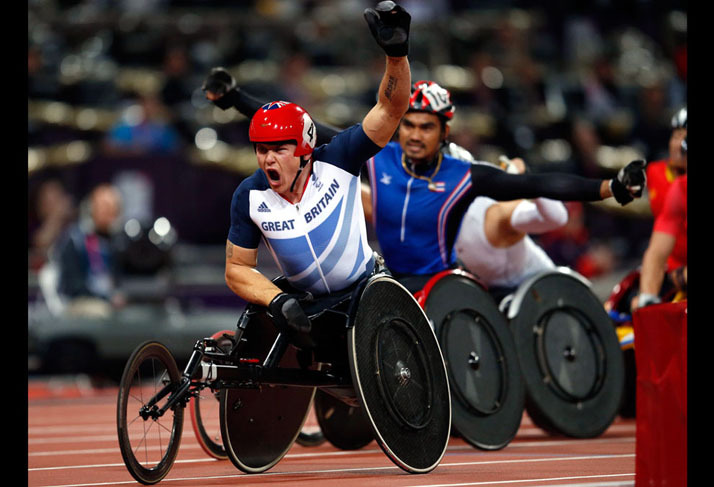 British gold medalist David Weir celebrates after crossing the finish line in the men's 1500m T54 category final at the 2012 Paralympics, on September 4, 2012, in London. (AP Photo/Matt Dunham).